Do You Cook Pasta Before Putting It in Soup? Like most controversies, the question of whether to add pasta to your soup cooked or uncooked is one that doesn't have a single answer. The answer depends a little on the type of noodles you're using, a little on the type of soup you're making and a little on your own personal preferences. If you're using pasta made with semolina and egg -- in other words, what most Americans think of as traditional pasta -- adding it to your soup uncooked for the last eight to 10 minutes of cooking time is perfectly acceptable. The semolina-based pasta won't absorb too much liquid during that amount of time, and adding it uncooked will ensure that the pasta doesn't become too soft and sticky. Pasta made with other ingredients, such as buckwheat, soy flour, kamut or quinoa, is naturally stickier and softer than semolina pasta, so it's smart to cook it al dente on its own, then add the cooked pasta to the soup just before you serve it, as Frances Boswell does with her miso noodle soup recipe for "O, The Oprah Magazine." Cooking noodles in soup broth -- as opposed to boiling water -- will give your broth a cloudy appearance, but this doesn't affect the flavor, explains MrsWeiss.com, the website for the New World Pasta company. If you're making a chunky soup with lots of vegetables or protein or if you're adding cream to your soup to smooth its texture, this slight cloudiness isn't an issue. If you're making a soup like consomme or a minimalist chicken noodle soup, where the appearance of the broth is obvious, you may want to cook your noodles al dente before stirring them into the broth at the very end of your cooking time. If you're cooking soup just before you serve it, whether you add the noodles at the very end after they've been cooked separately or add them uncooked 10 minutes before the soup is due to finish doesn't really matter. But if you're cooking your soup ahead of time to serve hours or days later, don't add the noodles until you're reheating the soup to serve it. Noodles left to simmer in soup for too long become slimy and overly soft, and they can break down and make your soup too starchy. If you're adding them on reheating, you can add uncooked pasta after the soup is simmering steadily and cook it for 10 minutes or cook your pasta separately and add it just before serving. Whether you're adding your pasta to boiling water to cook separately or to simmering soup, be sure to stir it into the liquid immediately after adding it -- this will help prevent the starchy noodles from sticking together, explains "Fine Cooking" magazine. If you're cooking your pasta separately, resist the urge to add oil to your cooking water to prevent sticking -- the oil will slick the outside of the pasta so the soup doesn't adhere to it properly. 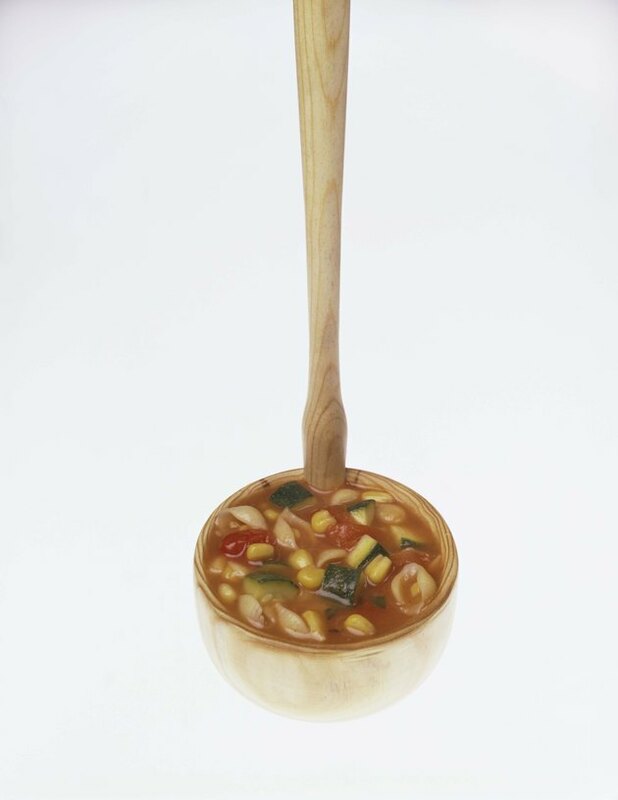 Keep in mind that pasta's cooking liquid is a natural thickener, so if your soup is turning out thinner than you would like, consider adding uncooked pasta to the soup to cook or stirring a little of the pasta water from separately cooked pasta into your soup.